LuckySearch123.com is the PUP that uses misleading techniques to prevent removal. Use Reimage to locate malicious components and get rid of them faster than with uninstall instructions. A full system scan blocks virus reappearance and prevents traffic to malicious domains. Distribution methods used by this browser hijacker? LuckySearch123.com virus is a browser hijacker which presents itself as a global leader in search engine marketing. However, because of its desire to increase advertising revenue, its users can suffer from unwanted redirects to malicious websites, annoying pop-up ads and tracking. Developed by Asia-based company, this program has been spread using software bundles, so can get infected with LuckySearch123 without their awareness. When it manages to get inside the PC, virus hijacks all web browsers, including Chrome, Firefox, IE, Safari and others. 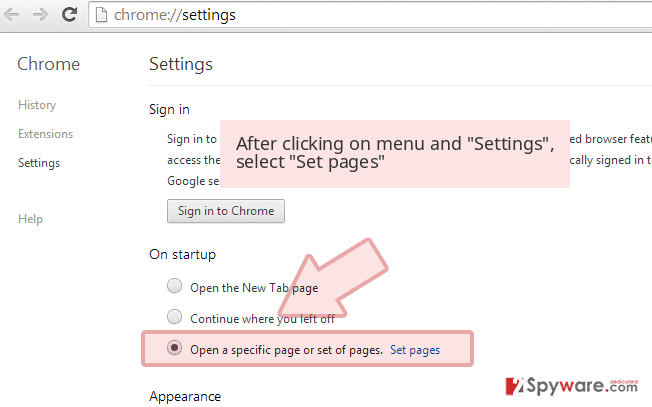 It can install browser helper objects and similar components that can cause changes in your start page, the default search engine, the new tab URL, etc. As a result, victim starts seeing this bogus website every time he or she launches the browser or opens a new tab. The first instinct always suggests going to browser’s settings and resetting them. However, you cannot run away from the browser hijacker so quickly. In order to get rid of this computer infection, you have to go hard and remove LuckySearch123 with the help of Reimage or other reputable malware removal utility. Just like any other browser hijacker, this one has been actively spread in a bundle with free software. Indeed, this virus cannot infiltrate the system itself; it needs permission from the owner of the computer. You gave this permission when you installed one of the recent programs. Browser hijackers spread bundled with freeware or shareware and are hidden as additional programs under “Standard” or “Recommended” installation setup. Generally, if you want to avoid LuckySearch123.com hijack, you should not install applications using this setup. Instead of recommended settings, choose “Advanced” or “Custom” mode. During the installation, carefully follow each step and read all provided information. You have to be aware with what you agree. For example, you may encounter a list with pre-selected applications or statement saying that you agree to make LuckySearch123 your homepage. You have to deselect all these items. If installation wizard does not let install program without its additional components, you should quit the installation because your chosen software is not reliable. To remove LuckySearch123.com from the system, you can use manual or automatic removal options. We recommend the latter method because anti-malware programs can quickly wipe out the virus from the computer along with all its components and helper objects. Keep in mind that for those, who don’t have required knowledge, it may be hard to perform removal steps manually. However, if you feel capable of fighting the virus bare hands, follow our manual LuckySearch123.com removal instructions at the end of the article. Once the virus is gone, don’t forget to check your web browsers, remove all suspicious extensions and reset their settings. Keep in mind that using this bogus search engine is not recommended. To remove LuckySearch123 from Windows, you have to find the program which has brought browser hijacker in computer and eliminate both of them. 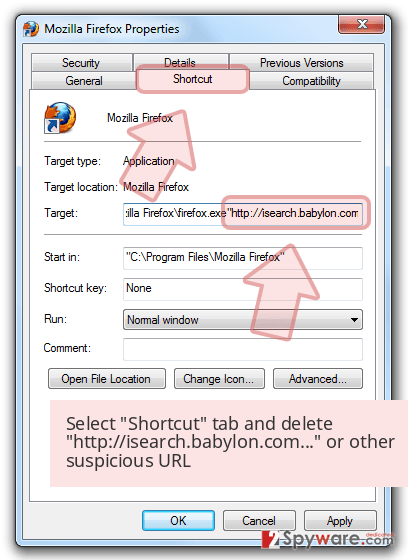 Make sure that hijacker hasn’t installed any suspicious applications and don’t forget to reset all your web browsers. Here, look for LuckySearch123.com or any other recently installed suspicious programs. Wait until you see Applications folder and look for LuckySearch123.com or any other suspicious programs on it. Now right click on every of such entries and select Move to Trash. To get rid of this virus from IE, make sure you find additional extensions that were installed by this virus without your knowledge. Follow the instructions and check the list of add-ons. Do you find something suspicious? If yes, remove those entries as shown below. 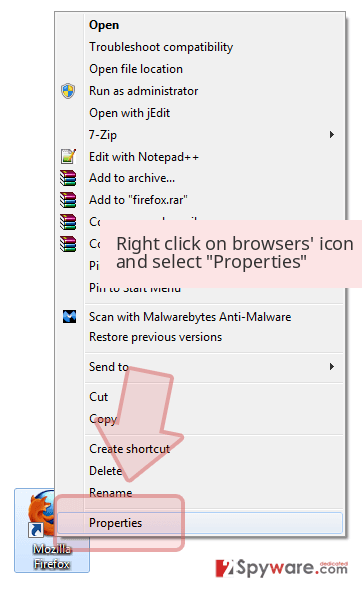 When in the new window, check Delete personal settings and select Reset again to complete LuckySearch123.com removal. To fix Microsoft Edge, you need to remove suspicious extensions that could be related to LuckySearch123. Browser hijacker is capable of installing various plugins that may cause problems or initiate another hijack, so make sure you eliminate them as well. Once these steps are finished, LuckySearch123.com should be removed from your Microsoft Edge browser. 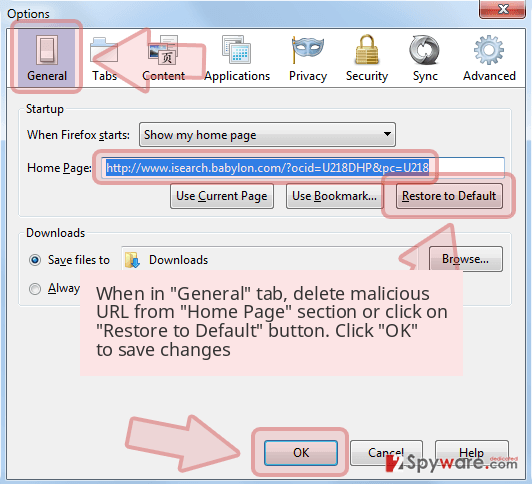 To remove this browser hijacker from Mozilla Firefox, make sure you find every questionable entry that delivers ads, spies on your browsing activity or initiates other problems. You should remove all these suspicious entries. Here, select LuckySearch123.com and other questionable plugins. Click Remove to delete these entries. Now you will see Reset Firefox to its default state message with Reset Firefox button. Click this button for several times and complete LuckySearch123.com removal. To remove LuckySearch123.com from Google Chrome, you need to remove related extensions, plugins or toolbars. Make sure you check the list of recently installed extensions and uninstall questionable and unwanted apps. Here, select LuckySearch123.com and other malicious plugins and select trash icon to delete these entries. Click Reset to confirm this action and complete LuckySearch123.com removal. 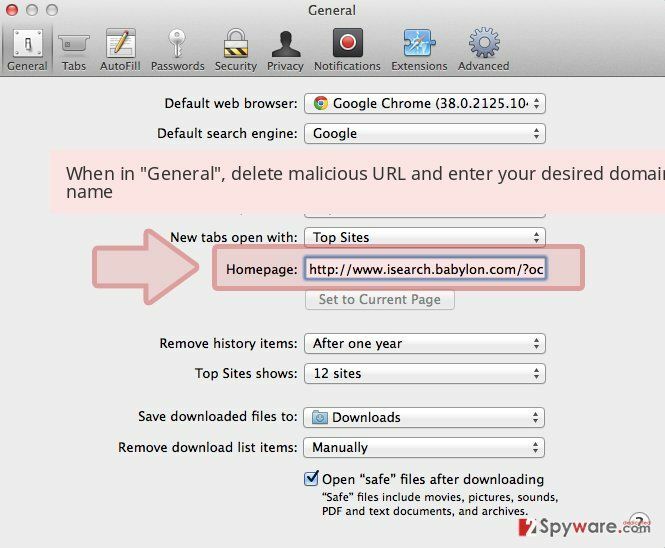 Follow the instructions to remove this virus from Safari web browser. Look for extensions that may be related to this annoying browser hijacker and uninstall them without hesitation. 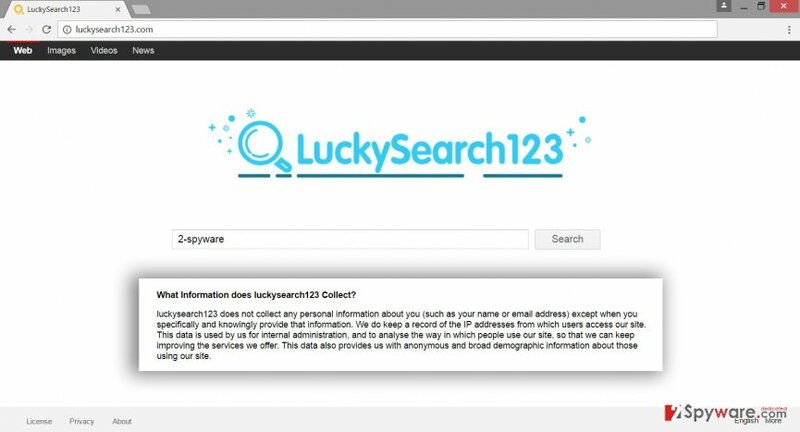 Here, select Extensions and look for LuckySearch123.com or other suspicious entries. Click on the Uninstall button to get rid each of them. Here, look at the Homepage field. If it was altered by LuckySearch123.com, remove unwanted link and enter the one that you want to use for your searches. Remember to include the "http://" before typing in the address of the page. Now you will see a detailed dialog window filled with reset options. All of those options are usually checked, but you can specify which of them you want to reset. Click the Reset button to complete LuckySearch123.com removal process. This entry was posted on 2017-04-26 at 02:04 and is filed under Stealing programs, Viruses. You can quickly scan the QR code with your mobile device and have LuckySearch123.com virus manual removal instructions right in your pocket. How did you remove LuckySearch123.com virus?